Ever since I got serious about cooking I became obsessed with homemade anything, homemade taco seasoning, homemade whipped cream and yes, homemade ranch dressing. Why? Well, I could say that it’s all about the health benefits since anything made at home will pretty much be as fresh as you can get. There will be no preservatives, no MSG, no weird stuff that you can’t pronounce. And sure, I’m all for healthy and fresh ingredients. However, I have to admit that I do it more for the challenge. I want to stand up proud next to my whatever homemade stuff while everyone says “Wow! You made this? !” and then me say “yeah, that’s right, I made it”. It almost makes me feel like Wonder Woman… almost. So of course with all the amount of money I was spending on the ranch dressing dry mix packets to make some of my recipes I thought enough of this, let’s make it from scratch. And so my quest began. First I tried to sniff the store bought stuff to get an idea of what the ingredients might be. Then I tasted it and then I touched and even though I thought I got most of the ingredients right, I got tired and decided to look up a recipe online instead. Google is your friend. And recipes I did find but many of them sounded kind of icky and bland if you want me to be honest. The only one that caught my attention was the one I found on Perry’s Plate. Of course I had to change it up a bit for my liking but it was a great base to start off of. 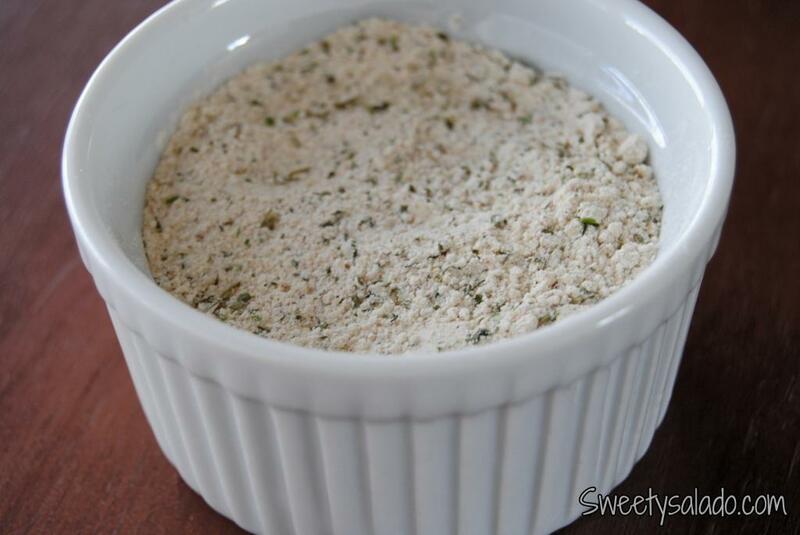 As a side note, most recipes ask for dry buttermilk which is the main ingredient for making ranch dressing and it can easily be found in the baking section of your grocery store. However, after researching this recipe for many months, I found many posts recommending using dry milk as a substitute. Now, I have not used dry milk myself but based on the smell, texture and flavor of both ingredients they’re pretty close, so it doesn’t hurt to try it. If you do, please, let me know how it turned out, I would love to hear your results. Oh! 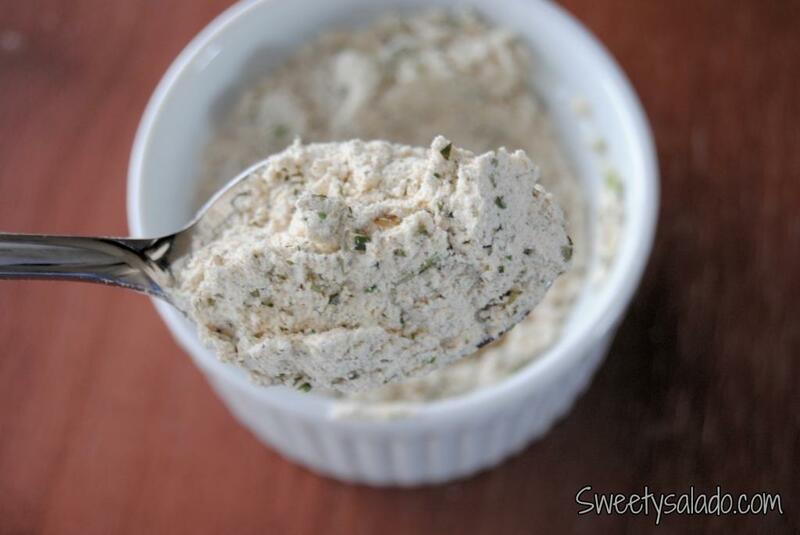 And if you’re wondering if this recipe for homemade ranch dressing dry mix is close to the real thing, you better believe it is. It’s wonderful! ¡Buen provecho! 1. Put all ingredients in a large bowl and mix. You can also use a food processor or blender to get a finer, softer texture. 2. Store in an airtight container in a cool, dry place. What do you mix with it to make the actual dressing? You can mix 2 tablespoons of this mix with ¼ cup of mayo, ¼ cup plain yogurt and ¼ cup of milk to make ranch dressing. It's that easy! Buttermilk powder needs to be refrigerated; should the ranch dressing mix be refrigerated too? It depends on the buttermilk powder that you use. The two brands that I usually use do not have to be refrigerated (Saco and Honeyville). If using either one of those two brands or a similar product you only need to store it in a dry, cool place. I believe Bob's Red Mill does need to be refrigerated, so in that case you would have to refrigerate this mix as well.